This notable eye catcher is situated along Nnebisi Road and it is within close distance to St. John Bosco’s Catholic Church. This double sided billboard is located between Ibusa junction and Ogbe-ogonogo Market. This advert messages on this billboard is assured to constantly draw to itself a tremendous pool of traffic, and it creates an unending exposure of company’s brands of products and services. 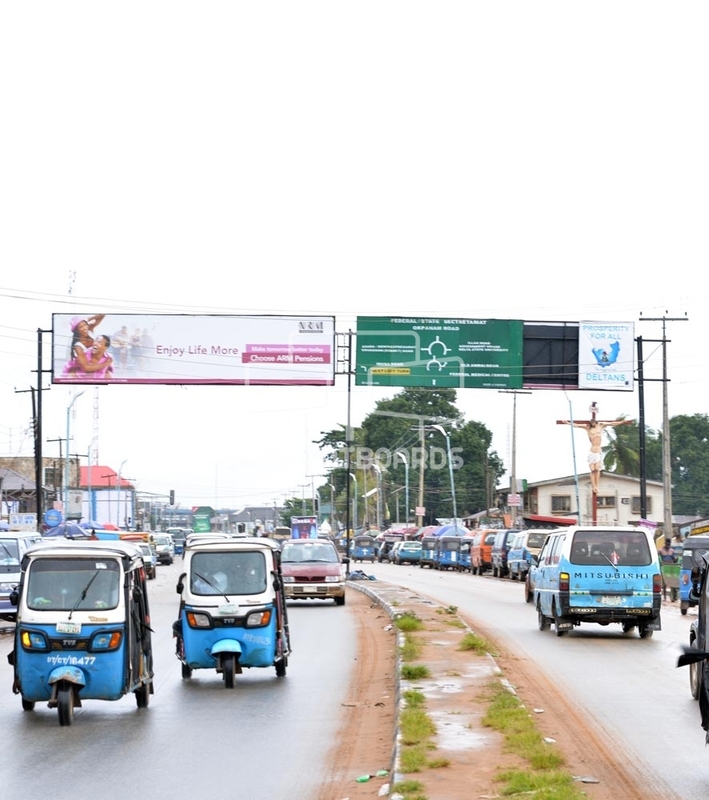 Advert message on this gantry billboard is visible to both vehicular and pedestrian traffic facing from Onitsha and traffic facing to Okpanam. This Gantry is also within close proximity to the highly recognized Ogbe-ogonogo Modern Market, Asaba Township Stadium and the Federal Medical Centre which is a great deal for advertisers aspiring a strong impression. This notable eye catcher is situated along Nnebisi road and it is within close distance to St John Bosco’s Catholic Church. This double sided billboard is located between Ibusa junction and Ogbe-ogonogo Market. This advert messages on this billboard is assured to constantly draw to itself a tremendous pool of traffic, and it creates an unending exposure of company’s brands of products and services. Advert message on this Gantry is visible to both vehicular and pedestrian traffic facing from Onitsha and traffic facing to Okpanam. This gantry billboard is also within close proximity to the highly recognized Ogbe-ogonogo Modern Market, Asaba Township Stadium and the Federal Medical Centre which is a great deal for advertisers aspiring a strong impression.